Programming will begin in the morning and run through the day into evening, with some films repeated. Meanwhile, the WIFF monthly screenings began in January with two films scheduled on one day every month – the second Thursday - at the Capitol Theatre (photo left) downtown, the festival’s main venue. The next films are scheduled May 10 – Final Portrait starring Jeffrey Rush, about the artist Alberto Giacometti, and Foxtrot, an Israeli drama about a family whose son is serving in the Israeli military. Final Portrait will have two screenings at 3.30 and 7.55 and Foxtrot one at 5.45. It’s not the first time WIFF has screened monthly films as a year-round way to keep the spirit of the popular autumn fest alive, and to show good films of course. 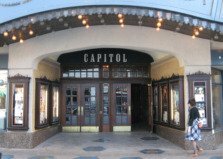 A few years ago WIFF also screened monthly films at the Capitol but Georgie said those screenings “overnight” became digitally disrupted when the industry moved to digital from analogue projectors, and WIFF had none, so was left high and dry. Meanwhile, WIFF will add a third venue for this year’s main festival, which kicks off Oct. 29. This will be the downtown former Armouries building, recently repurposed by the University of Windsor for its creative arts school. Georgie also heads up the school but WIFF will pay rent to the university for the space. He says the venue has a great new theatre that will work excellently as a screening room. This new venue takes the festival 360 degrees back to its early years, when the Armouries served as a venue, though at that time a portable screen was set up within the old drill hall. WIFF in 2016 was declared the second biggest festival among 158 events on the Toronto International Film Festival (TIFF) circuit. That year it sold 17,000 tickets. TIFF provides some of the movies show at the Windsor fest. George says the lion’s share – about $170,000 – is going towards a new digital projector, still on order. The festival was earlier provided a small digital projector by the University of Windsor.